Nightmare on Elm Street‘s Freddy Krueger may get his power from souls on Elm Street but his style is courtesy of the spirit of Hollywood. 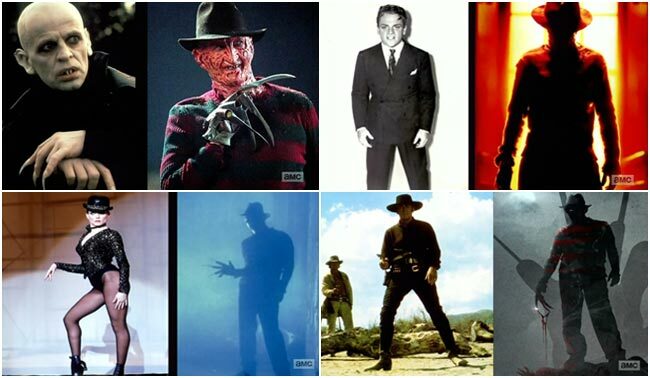 Freddy’s mannerisms are the amalgamation of several disparate sources Robert Englund revealed on AMC’s Comic Book Men. Freddy’s iconic glove is often displayed prominently against his chest shadowing the technique used by Klaus Kinski in Nosferatu the Vampyre. Englund followed in the footsteps of James Cagney, who employed a wide stance to cast an imposing figure despite his diminutive stature. Freddy has a flare for drama, which is punctuated with asymmetrical poses usually reserved for Broadway musicals like All That Jazz by choreographer Bob Fosse. And Freddy’s glove hand has a tendency to hang low like a gunslinger in old western movies. Such a pose not only draws the eye to the glove but also builds anticipation for when Freddy inevitably raises hell. Englund demonstrated by mimicking a fast draw with his glove. The television cameo just scratched the surface of Freddy. A more in depth insight into the character is revealed in the documentary Never Sleep Again: The Elm Street Legacy. The character also drew on director Wes Craven’s childhood. Freddy was named after schoolyard bully who tormented Craven. And his sadistic personality was inspired by a childhood incident in which Craven looked out his window and found a man staring back at him. “The thing that struck me most about that particular man was that he had a lot of malice in his face and he also had a sort of sick sense of humor of how delightful it was to terrify a child,” Craven recounted. Englund dropped by the Secret Stash to hand deliver a glove as a birthday present for the comic book store’s resident victim, Ming Chen. Not one of the mass produced toys you’d find at Walmart but a hand-crafted prop replica by Anders Eriksen of Nightmare Gloves. In fact, Englund proudly wears one on the book cover for Hollywood Monster: A Walk Down Elm Street with the Man of Your Dreams. The gift was signed: “This is God.” The quote is Freddy’s retort to his first victim, Tina (Amanda Wyss), who begs God to save her from the demon. The fictional glove was crudely fashioned in a boiler room. Englund describes it as “A junior high school shop project from hell.” But its origin is much more primal and evokes instinctual fears. Craven says he was inspired by mankind’s original nightmare weapon: the claws of a predator.